We tend to live life looking forward. As a child, we anticipate our next birthday; as a teenager, we anticipate graduation; as an adult, it’s the next promotion or new home. If truth were told, we spend our lives with our noses pressed against the future by living only for what we are looking for. In this series, Philip De Courcy reminds the Christian that the early church lived every day looking forward to the Second Coming of Christ. 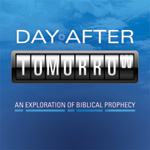 Join Philip as he travels into the future through a look at biblical prophecy. This series includes topics such as the Rapture, the judgment seat of Christ, the Great Tribulation, the rise of Antichrist, and the Battle of Armageddon. This is a look at the future that will help shape or reshape our lives today!